Back in February I wrote a series of posts about Ninject and ASP.NET MVC, and how to adapt Ninject v1 to inject dependencies into ActionFilter. Now that Ninject 2 reached the Beta status and a final release could be on its way, I think the time has come to to update the article. 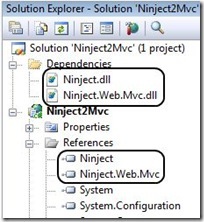 So in this post you’ll learn how to use Ninject v2 to inject dependencies into ASP.NET MVC controllers and action filters. Ninject 2 has been rewritten from scratch, trimmed down a lot, many non-core features removed, and a plugin/extension model has been introduced. You can read more details about the new features on Nate’s blog. The main change that impacts the integration with ASP.NET MVC is that it is now in its own project, called Ninject.Web.Mvc, and that it now includes filter injections by default. So no more need of the small utility I developed to support injection into ActionFilters. The zip files are just the dump of all the tree in the repository. Once you download them, you have to extract and then build the two project. But if you don’t want to go through all that process, the code sample attached to this post contains the beta version of Ninject core and of the ASP.NET MVC extension. For your convenience here are some snippets with the parts of the code that are relevant for the sample. What the controller does is just calling the service and putting the greeting returned inside the view model. Also the action is decorated with an ActionFilter that sets the title of the page, always retrieving it from the same greeting service. And finally the view, whose only purpose is displaying the message to the user and setting the title of the page. Let’s see each one of these steps. Copy them into a folder inside your solution and add the references. This step is the one that differs the most from version 1.5 of Ninject. You still have to inherit from NinjectHttpApplication instead of HttpApplication, but the way you register the controllers is different. All the initialization code of the web application, the one that would normally go into the Application_Start method, now has to go into the OnApplicationStarted one. Inside this method goes the setup of the routing table and the call to the method that registers all the controllers of the application. This method scans all the types inside the assembly supplied, and registers for injection all the controllers it finds. The Ninject Application class also makes easier creating and configuring the kernel, through the CreateKernel method. And what about the ActionFilters? You might wonder where all the configuration needed for injecting dependencies inside action filter went. The cool thing about Ninject 2 is that this kind of injection comes out of the box with the ASP.NET MVC extension. So the only line of code needed it the [Inject] attribute applied to the property of the action filter that will hold the injected dependency. Cool, isn’t it? Ninject v2 is looking very stable, and I’ve used it in production code, and didn’t give me any problem, so I really encourage you download the latest bits, and play around with it.